Who will be the bargain signings of the January sales? What do we have in common with football managers at this time of year? Well, we are all hitting the January sales looking for bargains. When the New Year comes around, all football clubs are faced with one crucial question: To buy or not to buy? Getting in two or three different players can give teams the extra ingredients needed to push for a title or to escape relegation, but new signings can also disrupt team chemistry and cause unwanted headaches for managers at the business end of the season. In my opinion, top clubs around Europe should only buy players in this winter transfer market who are either an experienced international able to add stability and leadership, or a young talented star with pace and energy, ideally coming off the bench. As club bosses look around for what they hope could be valuable additions to their squads, they could do a lot worse than utilize a tool I have been using for over a decade to spot talent: the computer game "Football Manager." I have been playing it since I was 17 years old, when it was called "Championship Manager." It has helped me find out about many talented players before they developed into stars in real life. Javier Saviola, Wayne Rooney, Leo Messi, Hatem Ben Arfa and Danny Murphy, for example, all matured into international-class players in the game before anyone else around had ever heard about them. The game has often made me look like a genius around my colleagues and friends, and it still keeps me updated on all the latest teenagers who could turn out to be the next big name. The latest version features an incredible database of over 400,000 players and staff. It’s compiled by researchers and scouts in every major footballing nation in the world, and is definitely a tool that managers could use as a starting point to look for new players. The director of the studio that produces the game, Miles Jacobson, told me recently that some clubs, such as English side Everton, already use the game to help establish their scouting network. Maybe in the future more teams and coaches will follow suit. So, using my personal knowledge and the help of Football Manager’s database, I have formulated a list of 10 players who would make an immediate impact if signed by any top team in January. 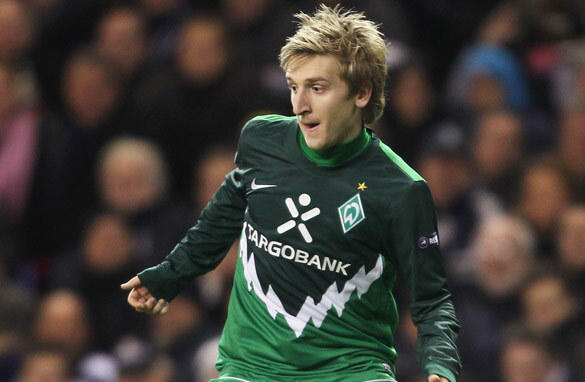 Marko Marin (Werder Bremen) – He has been called the German Messi and it’s not only because his frame reminds football fans of the Barcelona phenomenon. The 21-year-old combines all the skills that playmakers need to succeed: skill, creativity and flair. It's only a matter of time before he moves to a bigger club. Hulk (FC Porto) – A powerful Brazilian forward who earned his nickname when playing in Japan because of his physical similarities with the green superhero. The 24-year-old is the finished article. He has plenty of pace and power and combines it with a magical left foot to give defenders and goalkeepers in the Portuguese League nightmares. Sergio Araujo (Boca Juniors) – A speedy and skilful Argentine winger who at the age of 18 is already a star at "La Bombonera." He needs to bulk up in order to play in Europe, but has the raw talent needed to succeed. Adel Taarabt (Queen's Park Rangers) – The 21-year-old has been setting the English second division alight with his breathtaking dribbles, tricks and flicks after being discarded by Tottenham. The Morocco international is destined for a bigger stage. He just needs a manager who believes in his skill and gives him the necessary freedom to shine. Ganso (Santos) – Along with Neymar, the 21-year-old is one of the young stars of Brazil’s new football generation. A complete attacking midfielder in the mould of Kaka who is in need of a bigger challenge. Wagner Love (CSKA Moscow) – A proven goalscorer who has spent the last seven seasons in Russia (with the exception of short loan spells at his first Brazilian club Palmeiras and then Flamengo), the 26-year-old could make a difference right away if given a chance with a good club in a top league. David Luiz (Benfica) – One of the most talented defenders in Europe at the moment, this 23-year-old Brazil international has been become a cult hero with the Portuguese champions, but is ready to shine on a bigger stage. A great tackler, Luiz also has silky skills and is a master of building play from the back. Mahamadou Diarra (Real Madrid) – Frozen out at the Bernabeu, the Mali international still has a lot to give and could be an important signing for a team in need of a midfield warrior who is not afraid to dive into tackles. The 29-year-old would fit in perfectly at English club Arsenal. Nassim Ben Khalifa (Wolfsburg) – He was instrumental in Switzerland’s victory in the 2009 FIFA Under-17 World Cup, scoring four goals. It looks like the 18-year-old will develop into a fantastic player once he makes his mark in Germany, having left Grasshopper Zurich last February. Eden Hazard (Lille) – Hailed as one of the top young attacking midfielders in Europe, Hazard has been compared with Zidane after making his debut in the French league at the age of 16. Now 19, he has already been capped 17 times by Belgium and could become a star in a major league very soon. Hulk is not a bargain. He is a very expensive player protected by a huge contractual resignation clause. Hey guys If you like European Football and wanna see new Super Star , follow Muhammed Demirci in Besiktas JK. You can watch his skills on Youtube..
Mahamadou Diarra would NOT be a good signing for Arsenal. He'd be a realistic one because no one else probably wants him and he'd be cheap, but Manuel Neuer, Rene Adler, Shay Given- any of those would be a good signing. As a Belgian, congrats on pointing out Eden Hazard, though I am surprised you forgot to mention Romelo Lukaku (Anderlecht). Look it up, you'll be amazed. He'll either go to Chelsea, Real or Manchester City it now seems. Steve... the article says "Bargain" which part of Lukaku's transfer fee do you think will be a bargain? I think anderlect is asking for more than $40 Mill. It's one thing to talk about Ben Khalifa, but you forgot Xherdan Shaqiri who is already showing himself to be one of Switzerland's best players. Ben Khalifa made a mistake by leaving grasshoppers too early and going into the Bundesliga where he has almost no play time. Shaquiri has proven himself at Basel where he gets alot of playtime and as well experience playing in the Champion's League. Not to mention Shaqiri played in the world cup and also scored a great goal vs England is a Euro qualifying match. It good to get a new player at the right time. Wrong ...Diarra is going nowhere! He is thre to stay...what bout Ronaldhino? All of these players are well known by scouts and teams. Moreover they are very expensive transfers. And you're also ignore the fact that the Football Manager data is based on scout reports and information from other professionals. Diarra's combative game & his visionary passes would find a fitting home in Arsenal & give the team some much-needed steel in midfield. Regarding what Portugal has to offer... David Luiz, Fábio Coentrão and (of course) Hulk would be top signings definitely. But they are far from bargains! From those three, i reckon that David Luiz would be the best "business", because paying 30million euros for him is more than fair. After the buy, you would be certain that the money you just spent on him is totally worth it, based on the fact that there isn't a single player in the world with his skills and potential. The rest of the players mentioned by Pedro are excellent... but not all are bargains (Ganso must be SOOOO Expensive).. As far as the signing of Diarra goes... it makes sense a team like Arsenal that is full of young talent and needs more experienced players to balance their squad. Hardly any of those players are what you call 'bargain' buys. The likes of Luiz, Hazard, Hulk, Marin and possibly Ganso you're looking at £20m+ for each of those. Wouldn't exactly call that a bargain; they are all quality palyers, but not cheap. Using Football Manager to spot potential talent is a great idea. Now if my club can pay for the transfers with Monopoly money we could end up as world beaters. We might even win the Champions League, as long as it's being played on Playstation 3 this year. Marco Rojas (Wellington Phoenix) look him up Pedro! He, Pedro. What a shame there's no item about Coen Moulijn, one of the great legends of Dutch football on this site, not even a mention of his passing. CNN should really be ashamed of themselves. Did anybody forget Bryan Ruiz from FC Twente? Voted 2nd best player in Holland last year? Come on guys!!! The Costa Rican is ready to play for a big team!!! Marko Marin could end up being a great player as he has already proven himself as a young talent with alot of upside in his game. He needs to placed on a team that has fowards and a midfield that like to run. The only downside I see as of right now to his game is that he does not find the back of the often enough. Zhirkov from Chelsea should go in Real Madrid because Marcelo is not a really and good left back. Mourinho knows the russian's skills but I don't understand why doesn't he see that. Danny Murphy=as world class as a donkey. Haven't you ever played "One of these things is not like the other"? However, you lost all credibility before that with "Football Manager" references. No mention about Shaqiri? Star at FC Basel and at just 18 began his international career, and doesn't anyone remember Switzerland-England in September, where Shaqiri placed a stunning curling shot into the top corner of the goal, leaving Hart motionless? Also Nassim Ben Khalifa played spectacularly at the U-17 World Cup, but was recently playing in Germany's 4th Division for the Wolfsburg's reserves, where he gained little experience. Luckily, he managed to get a transfer to Nuremberg, where he will hopefully manage to get vital Bundesliga experience. Above all, a well written writing..